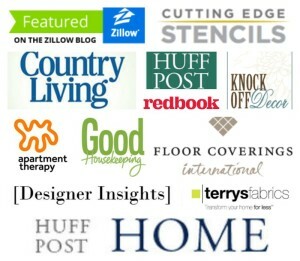 My friends do too and we get together every month to share a themed furniture makeover with you. This month’s theme is “SHADES OF WHITE”. 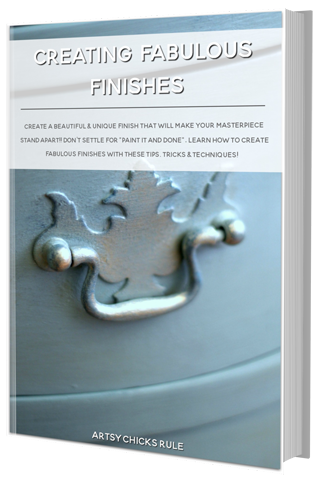 To see previous month’s themes, click here –> Themed Furniture Makeovers. 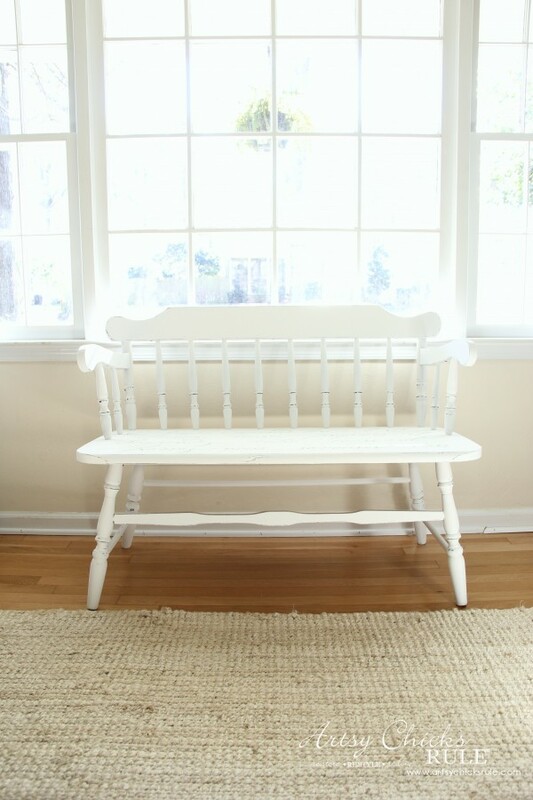 Today I’m sharing a white bench makeover that a friend of mine gave to me. It looks as if it were painted or something such as PolyShades was applied at some point. This is just for “before” purposes only. I gave a light sand to those chippy areas and got to painting. 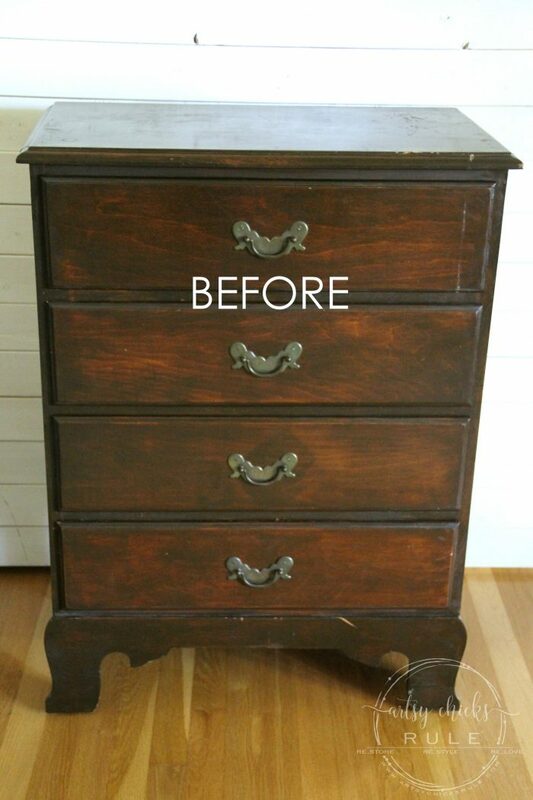 I used Chalk Paint by Annie Sloan in the color Pure White. 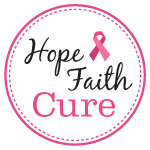 I’m including affiliate links below for your convenience in finding the products I’ve used. 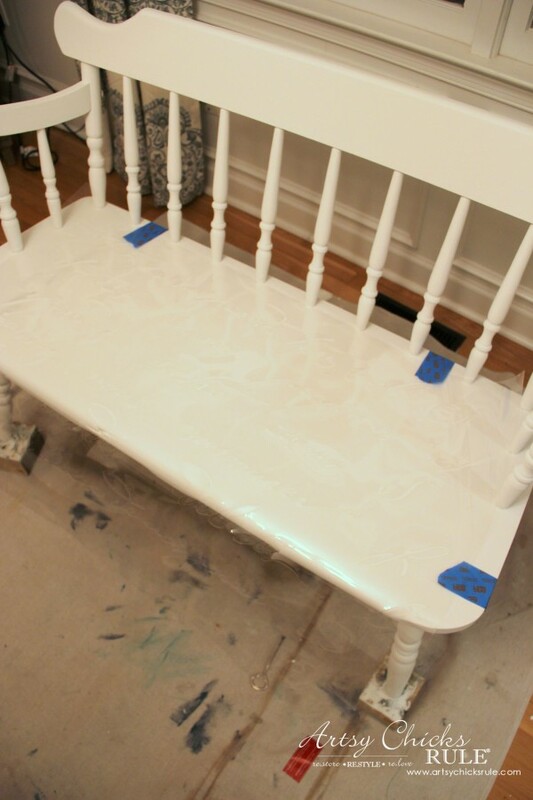 In case you don’t remember, I highly dislike painting chairs. Once it was good and dry I laid the stencil over the seat area. 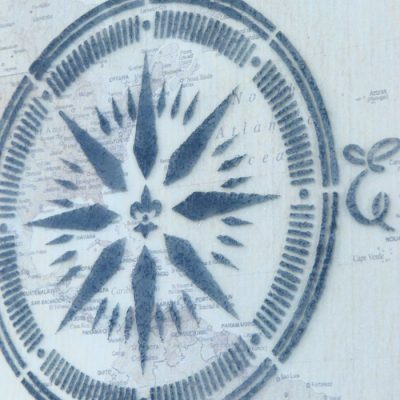 This is the stencil I used, French Poem Allover Stencil – DIY wall decor stencils – By Cutting Edge Stencils . It was gifted to me by a reader here who has become a dear, sweet friend of mine! 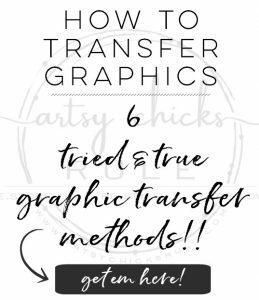 You’ll want to use a stencil brush similar to these…. The Artist’s Club Papillon Stencil Brush Set . I originally was going to do the stencil in black but decided I wanted it a bit softer than that. 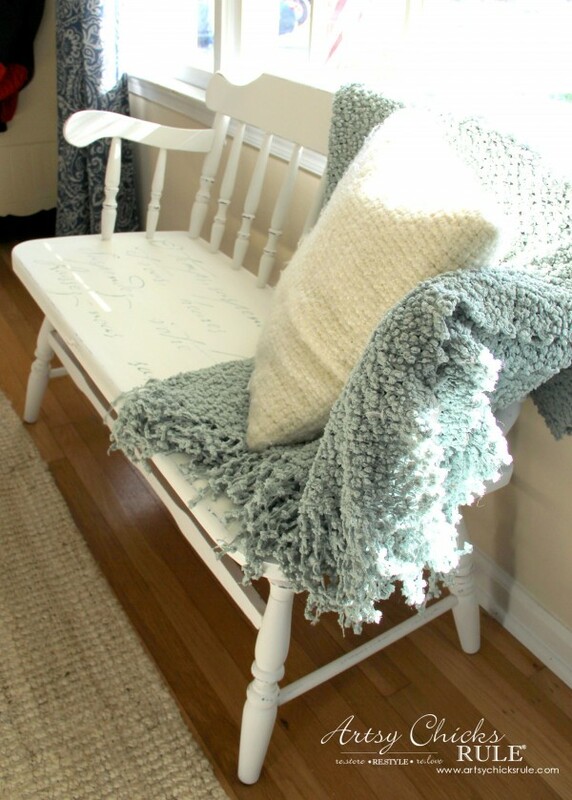 I used Chalk Paint by Annie Sloan in the color Duck Egg Blue instead. 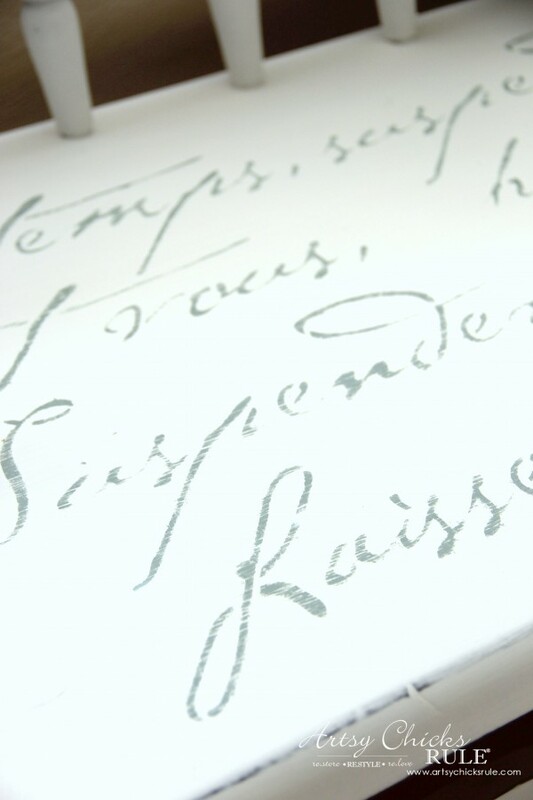 So much softer and prettier and goes better with that pretty French writing. And shhh….but I messed up a bit!! haha…clearly I am not a stencil aficionado. I totally forgot about the repeating pattern and just stenciled away! OOPSY! See the “O” and the “et” on the first and second lines??? Yeah…repeating pattern…and about when I noticed. And so my nice little stencil was not going to be centered because the last two lines had words that fell off the seat. I just picked two smaller words that fit and stenciled those instead. Alright, now that I have revealed my error, let’s get on with the makeover. 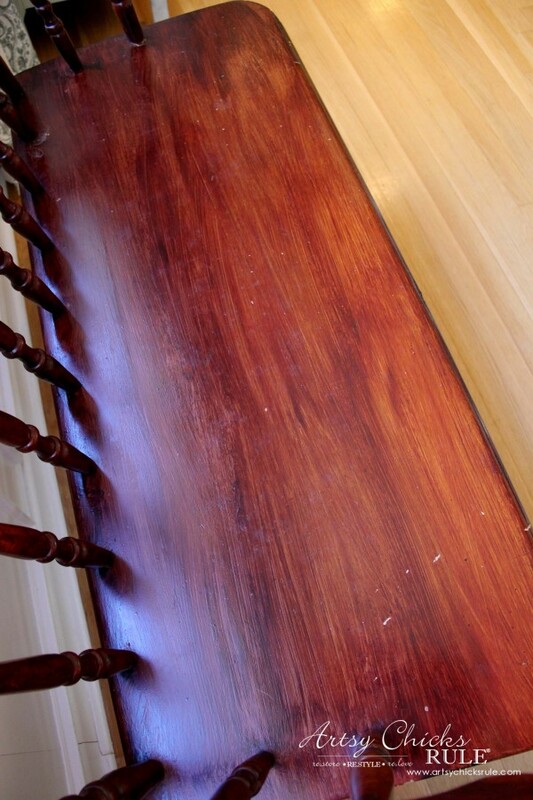 I used a fine grit sandpaper and lightly sanded every edge. And then also lightly sanded the French wording. 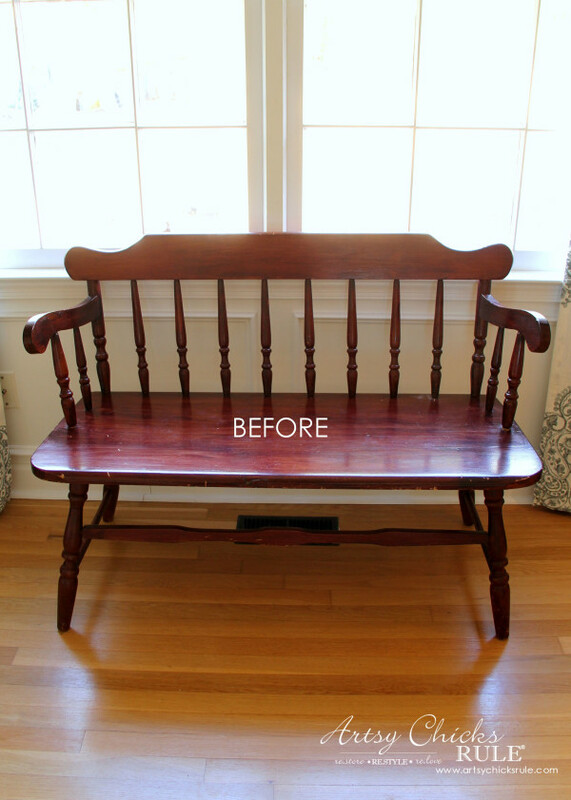 I wanted it to look like and old French bench, worn from age. 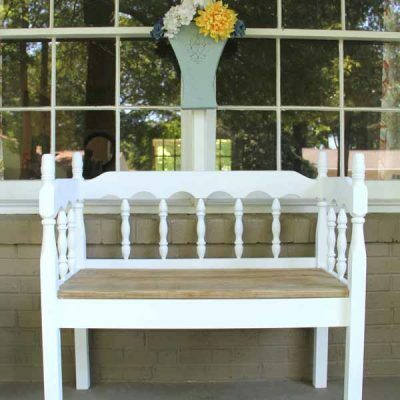 I originally thought I’d use this on my front porch but I quite like it right here. But it needed a little “cozy” so I added a throw and a pillow. I added a throw and a sweater pillow from Target. The pillow is similar to this one…Cotton Knitted Cushion Cable Knitting Super Soft Square Pillow Cover. Such a cozy sitting spot now! I love it here in front of the window. And I have to share the new pillow I just picked up from Michael’s last night. Look at those colors?! They match the throw and curtain beside it perfectly. Happy dance. I knew when I saw it, it would be perfect on the bench. I think I will layer it with the off white sweater pillow for a bit of contrast though! So there is my “Shades of White” themed makeover for this month. Next month’s theme is “Inspired by Chocolate”! I have NO clue what I’m doing yet….stay tuned, should be a fun one! 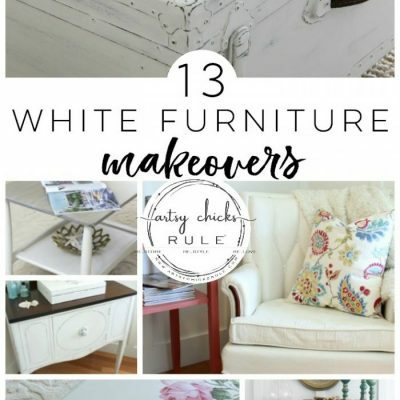 Check out what my friends did with their white makeovers this month. 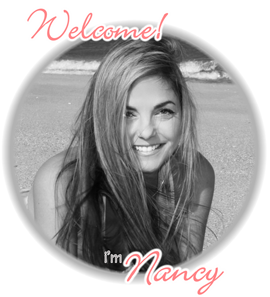 Just perfect, Nancy! So fresh and sweet. Pinning! I love the stencil on the white. What a great way to make it personal and artistic. Beautiful spot to enjoy the piece, too. Great job! This is beautiful! Love the stencil in the Duck Egg Blue. 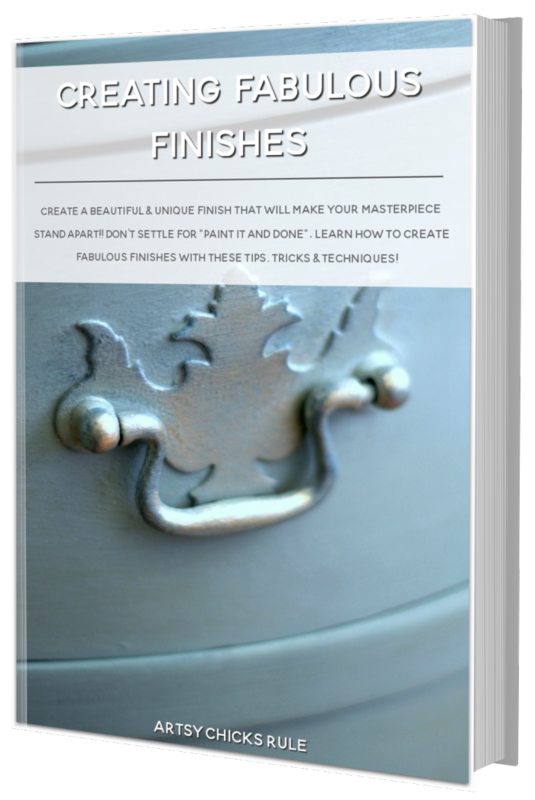 I’m with you on painting spindles and details like those, it takes forever:( I’d do it with a glass of wine, but then I’d be afraid to see what the finished project would look like! 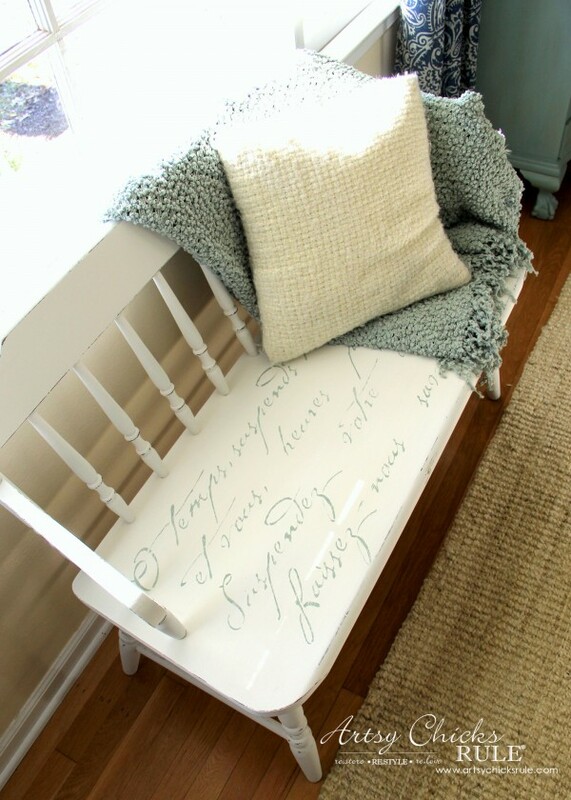 You picked the perfect sun filled spot for your bench! Great job! 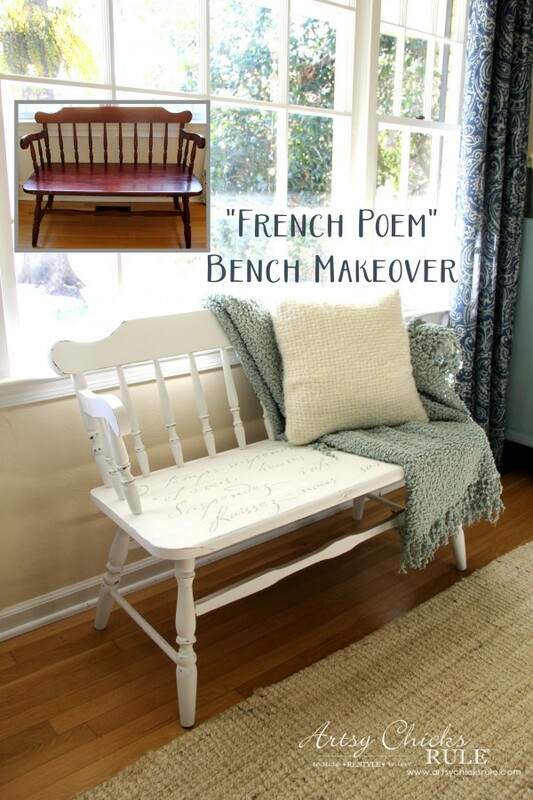 The French poem is the perfect touch for this pretty bench. In front of your window is a great place to really enjoy it, too. I’m loving it in this spot so far! What a perfect spot for the bench. And a white makeover is EXACTLY what it needed! 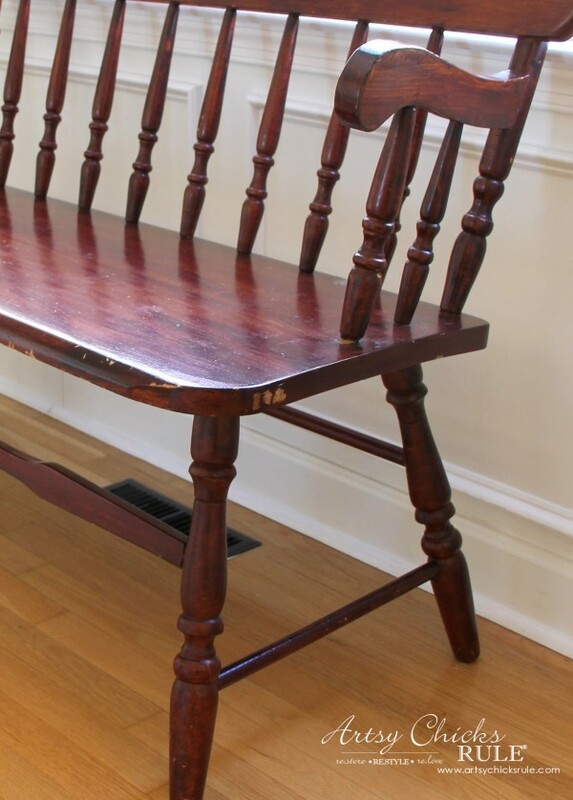 Wow, Nancy, what a beautiful bench! I KNEW you would do something fabulous with that stencil! And you did not disappoint! 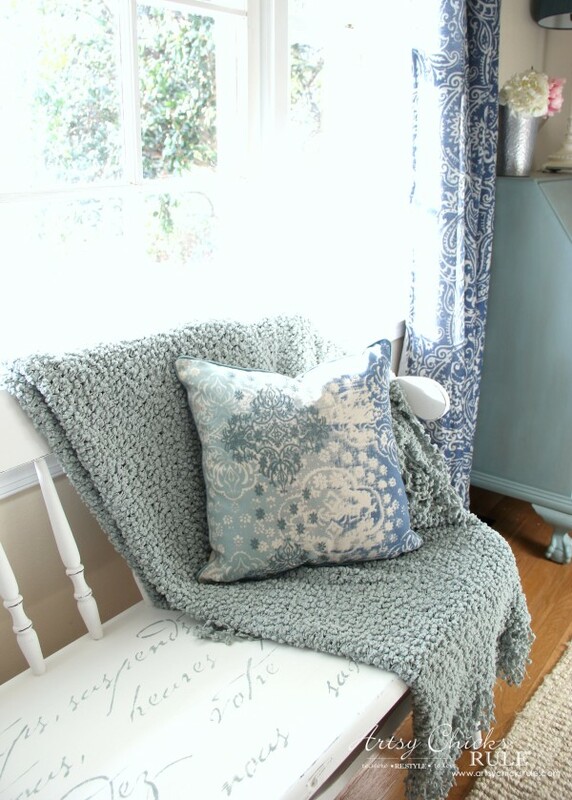 It really looks great with the beautiful blue throw and sweater pillow, too! It was perfect for this bench. I still think I may use it along the front of a dresser at some point too! 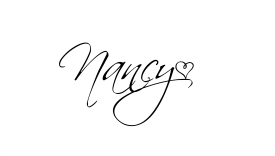 Nancy, I would have never noticed that error in the stencil had you not pointed it out. 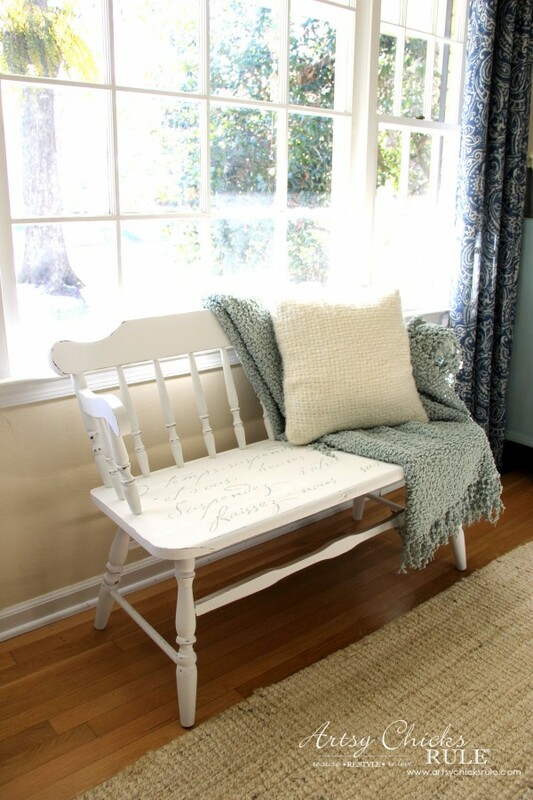 The bench looks gorgeous and perfect in front of that nice big window in your study. Being a Canadian Prairie girl who is knee deep in snow right now, I couldn’t help but notice the fern hanging outside the window…in January!!! We do have a bit of snow on the ground, a few inches! Not typical for us though. I am enjoying it while it’s here!! Thanks so much Jayne! :) They are…I should really just pull out the sprayer! But it’s hard when it’s in the 20’s outside. Brr! Thanks Jen! :) Free is an even better price! My oh My , Nancy . . . this is such a beautiful bench. 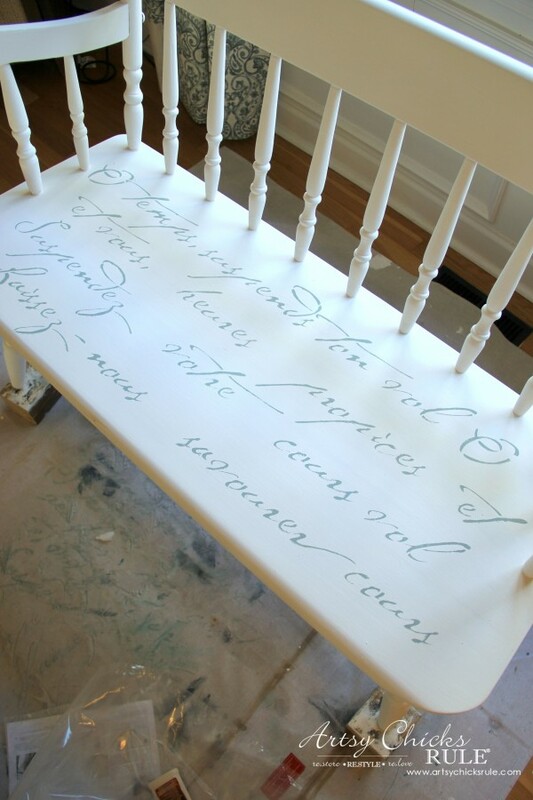 That french poem stencil makes it so darn sweet! I love everything about this bench. Thank you Gail! :) I am really enjoying it by the window! Thanks for the pin too! 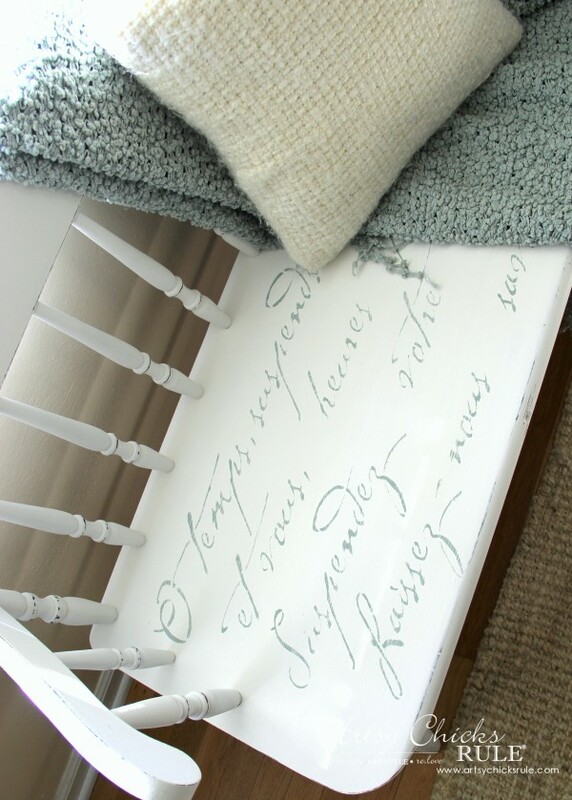 That pretty script caught my eye right away – I love it! And the colors that you chose: perfect! 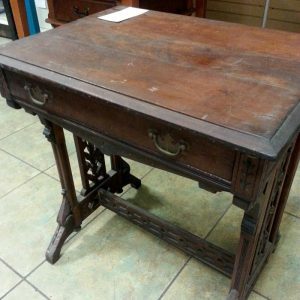 You have such a good eye for these things – so pretty! 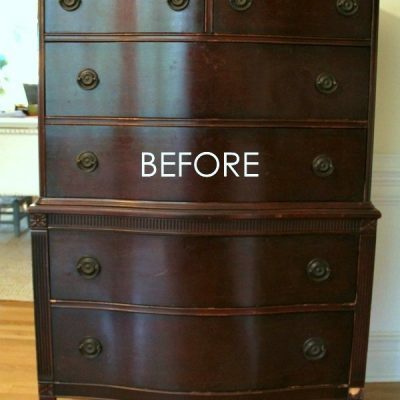 Such a pretty makeover! I actually have that same stencil and I never noticed the repeating letters! I’m so glad you mentioned it :). 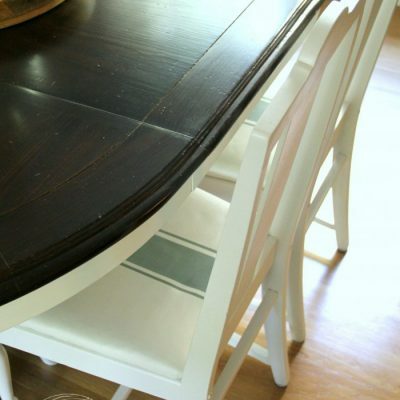 What a lovely spot and great makeover! This turned out so pretty Nancy! 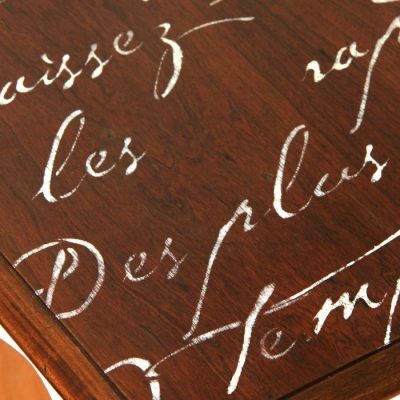 I love the french script and I would have never known about the oops! You know I love the blue that you chose! Thanks Shanna! :) Yes, blue love all the way! One of my favorite projects that you’ve done. You know I love my French decor! I have so got to pick up that stencil. 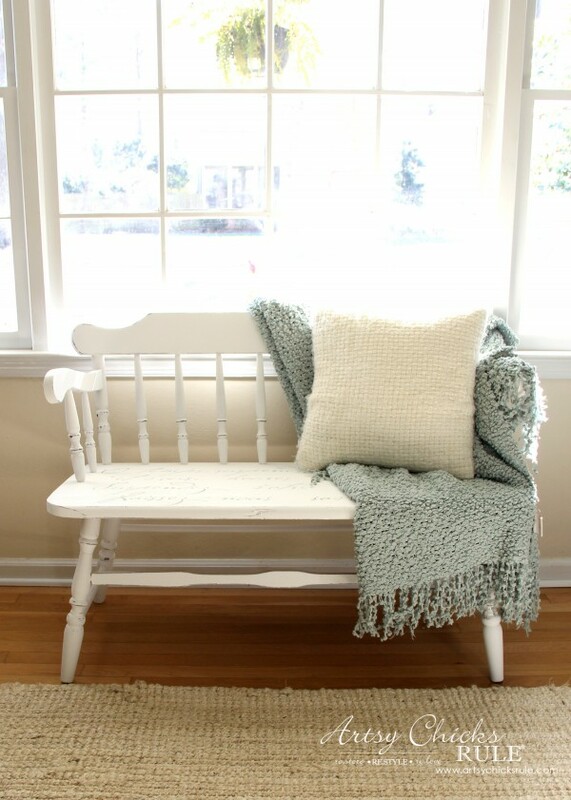 It is just perfect on this bench! Thanks! I really love it and am enjoying it by the window! :) Such a nice place to sit and enjoy the sun coming in! 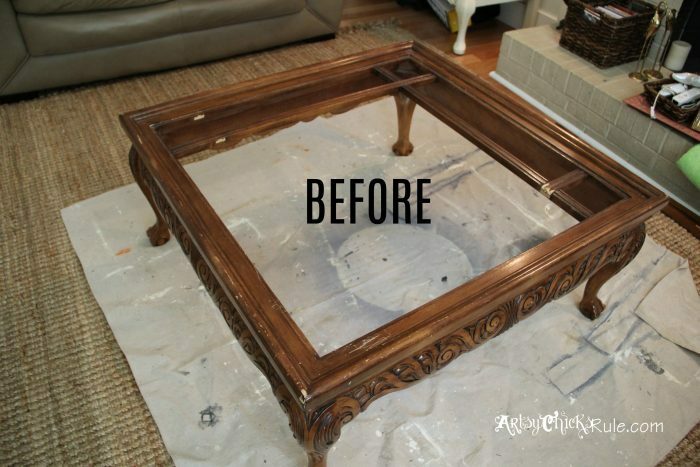 Can you use a sprayer with chalk paint?